I was primarily interested in NetSupport Help Desk for this roundup but after looking at the entire set of offerings in NetSupport TCO and NetSupport Help Desk, it was apparent that Help Desk was an additional application to be used with TCO. In today's corporate landscape spanning thousands of machines, help desk applications can be utilized entirely by enterprise customers for internal use. The tools that come with NetSupport TCO make this a very powerful solution for the help desk engineers because they have access to very specific information about users and their systems. NetSupport TCO/NetSupport Help Desk has some handy features, such as software and hardware auditing, Web metering and license management, NetSupport maps the entire network and stores the results in a SQL Server database. I mention the database now because I was very impressed with the installation program's ability to install and add my TCO database in one fell swoop. I installed the database, then loaded NetSupport TCO's client application and was able to add in my server and workstation systems on the 192.168.X.X subnet (my internal network). The Help Desk Web application uses PHP and requires manually configuring IIS to use PHP.exe, which is loaded with the Web installation. 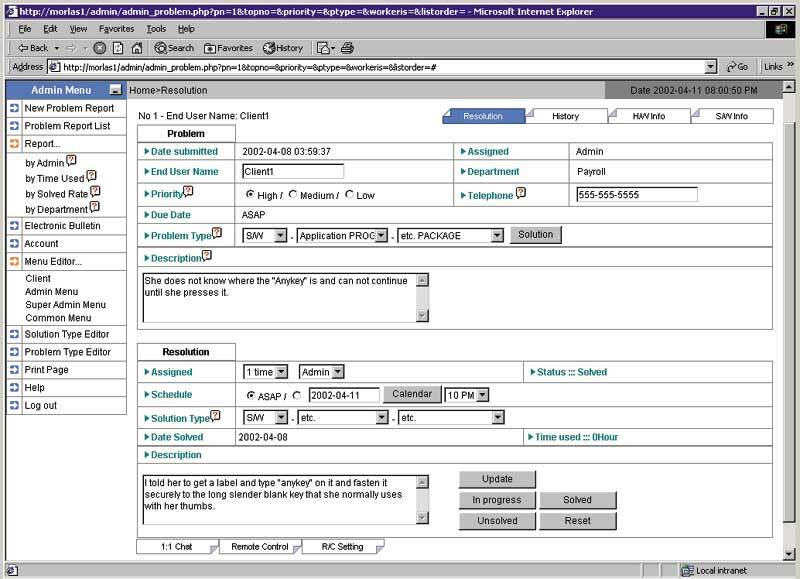 The process wasn't well documented, and I found it odd that the instructions explained how to set up the entire default Web site under IIS as the Help Desk Web site. 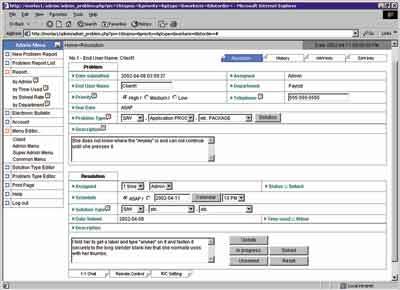 Once I had the Help Desk Web set up, though, it was easy to log into and navigate. I could tell immediately that NetSupport Help Desk was limited in features. The main goal with Help Desk, I felt, was to get the incident in and worked on. Of course there is absolutely nothing wrong with that goal, and for what it does, NetSupport Help Desk does very well and the Web interface is pleasing visually and functionally. There are standard reports, and the problem and solution areas are customizable as far as the categories into which incidents might fall, such as hardware or software. One nice feature that I haven't seen in other packages is the Electronic Bulletin Board. This is nothing more than a tote board of current incidents and their status but it is displayed in real-time. As I added incidents to my installation, I switched back and forth to watch the board. It updated as expected and from a manager's point of view I was comforted by the fact things were being handled accordingly without my intervention. NetSupport Help Desk is a nice complement to NetSupport TCO, which ultimately is where the true power of this suite of application lies. Having the ability to use remote control and chat immediately with machines that have their information stored in the TCO database makes supporting not-so-savvy end users a bit less frustrating for both you and them.